An hour before dawn Bob Pelkey picked me up for the two hour drive out to the Everglades Agricultural Area south of Belle Glade in West Palm County. I was on a return trip to bird the flooded sugar cane fields and sod farms for the migrants returning to Florida from parts way-up-north. Such as Upland Sandpipers, Wilson's Phalaropes and Gull-billed Terns. First stop was at the 6-Mile Bend Sod Farm, which again had little activity. Basically seen were Barn Swallows, Killdeer and a pair of Black-necked Stilts. 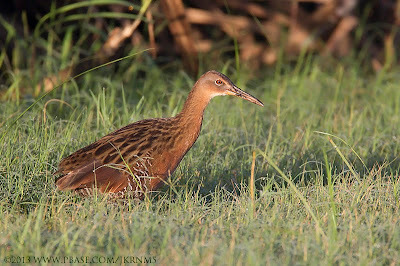 Next stop was a side road off of Sam Senter Road were got excellent views of a pair of King Rails. Barn Swallows were everywhere. Our best stop was a flooded field about three miles down Brown's Farm Road. We dipped here on any stilt sandpipers, which had been very numerous on an earlier visit to this spot.I believe that the water level had risen just enough to dissuade many of the shorebirds seen here back then. We had far fewer Short-billed Dowitcher, Greater Yellowlegs, Lesser Yellowlegs. But we did add a Pectoral Sandpiper, Least and Western Sandpipers, a Belted Kingfisher, Wood Storks, more Barn Swallows, Roseate Spoonbills, Glossy and White Ibis, several Gull-billed, Black and Least Terns, Laughing Gulls, Black-bellied Whistling Ducks, Fulvous Whistling Ducks, Mottled Ducks, Common Nighthawks, a Least Bittern, Green Herons, Great Blue Herons, Snowy and Great Egrets, Yellow-crowned Night-herons, Starlings, Red-winged Blackbirds and Brown-headed Cowbirds. Our visit to the sod farms along Rt 27 did not offer much. Best bird was a lone Tree Swallow, as we dipped on any uplands sandpiper. And at the nearby Bolles Canal, at a distant flooded field, requiring a spotting scope, we added American White Pelicans as well as everything already seen. On the way back to Ft Myers we added Swallow-tailed Kites, a Pied-billed Grebe and Crested Caracaras. But Bob wanted to introduce me to a venue I hadn't visited before. 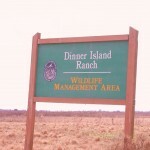 It was Dinner Island Ranch WMA. It is southwest of Clewiston in southern Hendry County and Bob had thoroughly enjoyed visiting back in April. We drove the main road encountering several bow hunters here for a four day bow hunting season. Here we added Sandhill Cranes, Northern Bobwhites, Red-shouldered Hawks, a Red-tailed Hawk, Eastern Meadowlarks, American Crow, a Limpkin and a Purple Gallinule. Last year, almost to the day, several of us birded the agricultural area south of Belle Glade for a great day exploring the sod farms, flooded sugar cane fields and rice fields for migrant birds. We had a lot of success with a count of about eighteen upland plovers and a great many other shorebirds, peeps, terns, whistling ducks and swallows. So far, this year the migrants have been slower relocating here, them we say in 2012. But, in the company of Stan Damen, we left Ft Myers by six in the morning to see what was available. Experiencing very light traffic we arrived at 6-Mile Bend Sod Farm on Rt 880 south of Belle Glade. We scanned the sod fields and could only come up with Killdeer, Grackles, a calling Common Yellowthroat and Barn Swallows. Tom Smith stopped by as he was birding the area as well. Tom gave us some in sights to current conditions, which did not seem very promising. Next was to check for any flooded fields along nearby Brown's Farm Road. Our info was that there was only one productive field so far. We find it about three mile south and found a nice variety and a few hits for Florida Challenge. We started with a family of Black-bellied Whistling Ducks and single Fulvous Whistling Duck. There was alone American White Pelican, lots of Mottled Ducks, White Ibis, Glossy Ibis and a couple of Roseate Spoonbills. Had at least 25 Black-necked Stilts, a hand-full of Stilt Sandpipers (256), Greater and Lesser Yellowlegs, several Dowitchers and Killdeer. Was able to identify a single Semipalmated Plover as well. A single Laughing Gull, Black Tern and Gull-billed Tern (257) showed up too. Barn Swallows were seen everywhere and a single Northern Rough-winged Swallow and several early Tree Swallows were seen near a pumping station. Many Common Nighthawks were encountered resting on open ground and atop telephone lines. We rechecked the 6-Mile Sod Farm and again found only Killdeer, but Stan did locate a single Uplands Sandpiper (258) a couple of fields away using his scope. We felt lucky to get the uplands as the sod fields were so barren of birds. This fact was true was we checked out the Kings Ranch Sod Farm on Rt 27. Last year we a lot of success here, but the birds were not here yet, except we did get a few Cliff Swallows (259). Probably the most productive flooded field we checked on was along CR 827, west of Rt 27 and on the other side of the Boles Canal from were we could make observations. It was just too far away to identify the smaller shorebirds. But we found dozens of Spoonbills, a couple of Wood Storks, several American White Pelicans and all of the expected waders. Yellowlegs and Dowitchers could be seen, but most of the other shorebirds were, frustratingly, too distant to. Hundreds of Brown-headed Cowbirds also seen today. Plan on returning in two weeks expecting more grass 'pipers and other migrants. Will need to return in early September to look for any buff-breasted sandpipers, which are not too commonly seen here and would be a lifer too, Wilson's phalaropes should be found by then as well.